Throw-in played into the two players in the middle who check away to receive. They take a touch round the corner and chip first time into the opposite throw-in takers hands. Vary the heights of the throw-ins and parts of the body that you receive the ball with. Players work in pairs in the middle. One runs to the receive the ball from the throw-in taker, he then fakes to receive the ball and bends his run at the last second. The throw-in taker then plays to the man behind him who plays the ball into the runners path. He then plays first time into the opposite throw-in taker. Different combinations from the full backs throw-ins. Switching play from the full-backs throw-in: The centre-back drops off and plays into the centre-mid who sets to the other CB and who plays into CM who switches to the opposite full-back. Vary combinations of switching play. 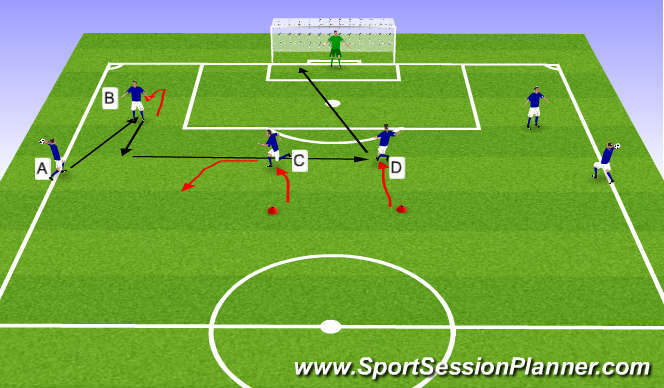 Introduce attacking players to join in with combinations. Throw-ins in the final third. Player A throws the ball in to player B&apos;s feet who sets back. Player a plays a quick and firm square pass to player C who fakes to receive and then dummies his run so that player D times his run and shoots at goal. Work both sides. Vary combinations with the two forward players. 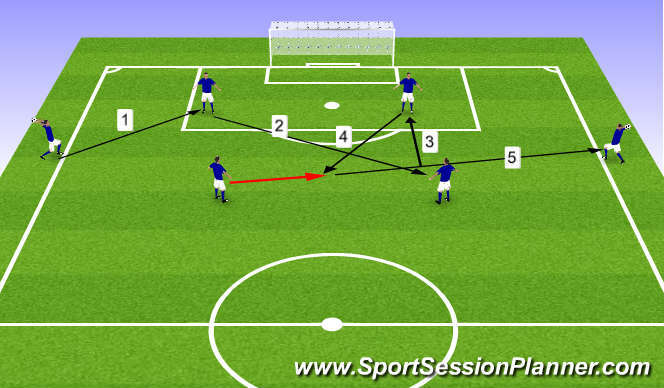 The throw-in taker can loft the pass into the box for the forward players.